Comfort Get a great sleep in our hotel quality beds. Your choice of large dorm, private double rooms, bunk rooms (sleeps 4) or separate bures. All beds complete with sheets, blankets, pillows and towels. We sleep 85. Location Located just 10 kilometers from the Suva city or a 95 cents on the local bus on a scenic 25 minute ride through urban Fijian villages and rainforest reserves. Taxi from Suva $7.00 to $8.00 Facilities With the facilities we provide you are sure not to miss out anything: - Backpacker Kitchen - Sky Television - Pool Table - Lockers - Coin-Operated Laundry - Hot Water Showers - Email, Phone, Fax and Photocopying service - Book Exchange - Restaurant - Fully Licensed Bar - Veraandah Cafe Activities Great activites to keep you entertained throughout your stay with us. Just a 5 minute walk away is Colo-I-Suva Forest Park , famous in Fiji for its waterfalls, bush walks and swimming holes. Other activities include: - Fishing & Rowing in our lake - Rare Fiji Bird Watching - Volleyball Court - Golf Hole-in-One on the lake - Pool Table - DVD Movies every night Dining The Raintree Restaurant seats 80 people and the verandah bar and cafe a further 30. The restaurant has become known for its beautiful water views, delicious fresh local food and warm ambience. Happy Hour every evening from 5pm to 7pm. Sited in an old quarry high above Suva, the lodge boasts two man-made lakes and a forest park next door. The big lake is available for swimming to house guests only. The water temperature is very pleasant and water supply is from underground springs. The smaller lake is full of fresh-water fish (Telapia) and is great for fishing. A small row boat and dugout canoes are available for use on the big lake. This Fijian ecotourism resort is a quiet, leafy haven for those who want to escape city life but still be close to everything in Suva and the rest of the Fiji Islands. There are a lot of birds to be seen on the property and in the Forest Park next door, so bird watching is a favourite pastime, especially sitting on your veranda overlooking the lake! Bushwalking trails are close to waterfalls and forest pools for picnics, BBQ's and swimming. Private tours to Fijian villages can be arranged. Volleyball can be played on the court opposite the recreation room and sunset competitions are a regular event. Keen sportspeople who want to play golf, tennis or lawn bowls, please bring your gear as very good facilities are available in Suva and outings from the resort can be organised. Must see spots in Suva include the National Museum, Craft Market and the Suva Produce Market [the largest in the South Pacific]. The 'Raintree Restaurant and Bar' serves both guests and locals, either in the large chiefly bure or from the outdoor cafe on the verandah. Raintree Lodge is located on Princes Road, Colo-i-Suva (pronounced Tholo-ee-Suva), opposite the Police Post and next to the Forest Park and the Forestry Department. Princes Road is the scenic alternative route between Nausori Airport and Suva. 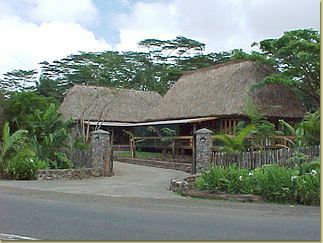 Raintree Lodge is approximately 15 minutes from the airport and 12 minutes from Suva. Trips to Suva are easy by local bus or taxi, at doorstep. How to Get There: If you are coming from Nadi, either fly to Nausori Airport or travel by bus to Suva. From Nausori Airport take a taxi ($12 FJD). From Suva take the local 'Saweni' bus (Tacirua Bus Company) from Bus Stand next to the market in Suva, 85 cents, children half-price, runs every hour, 6am-7pm, ask to get off at Raintree Lodge in Colo-i-Suva. Taxis from Suva cost $7.00 -$8.00 FJD.